“I am not a big fan of TV chefs,” Eater restaurant critic Robert Sietsema tells me over the phone. I’ve called him to discuss the phenomenon of TV-famous chefs opening ill-fated restaurants in New York City. Their record of late has been mixed, at best. Amanda Freitag tried and failed to resurrect Chelsea's Empire Diner, while Carla Hall’s Southern Kitchen suffered a series of mishaps and served its last plate of Nashville hot chicken less than a year after opening. And then there's Guy Fieri, whose Times Square venture Guy’s American Kitchen & Bar received a damning zero-star Pete Wells review in The New York Times. Still, as long as there are celebrity chefs, they will try to leverage their notoriety into a New York restaurant. Just this summer, two more came on the scene. 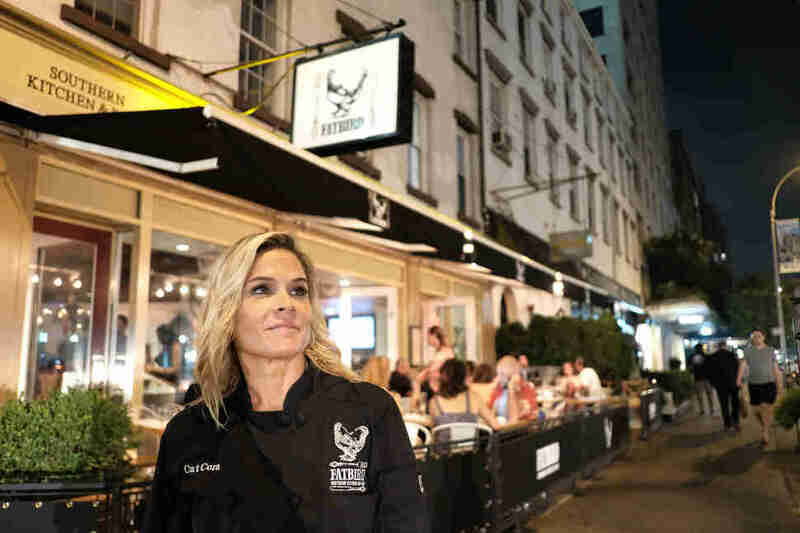 Iron Chef star Cat Cora opened upscale chicken joint FatBird, and has already sued her business partners for the restaurant's "lackluster performance." And Anne Burrell (also of Iron Chef pedigree) started Phil & Anne’s Good Time Lounge with bar maestro Phil Casaceli. Not even fame can protect these new ventures from the daunting physics of starting a restaurant in this city. With nearly 50,000 restaurants to choose from, and countless new openings, remodels, and menu re-launches every week, how can they attract actual diners? Sietsema’s curiosity keeps him going to these places, to see if maybe, just maybe, his skepticism is misplaced. He tries to judge each restaurant “very fairly” by its food and not its chef’s fame. But he can’t help being suspicious about chefs who rose to prominence on TV. “It’s often just based on wild haircuts,” Sietsema says, noting that Burrell and Fieri sport similar spiked faux-platinum mops. TV chefs who open restaurants in New York City, he says, are Icarus flying too near the sun. “It’s hubris to think that we are suckers who were born yesterday and we’re just going to accept them because they’re on TV,” he says. And yet, he returns. “It’s fun,” he admits. And for better or worse, these restaurants are more entertaining than most to watch -- not least, because their challenges are myriad, and unique. Anyone who books in at a celebrity-owned restaurant is at least a little excited about seeing that famous face from the TV. The trouble is, even celebrities can’t be in two places at once. 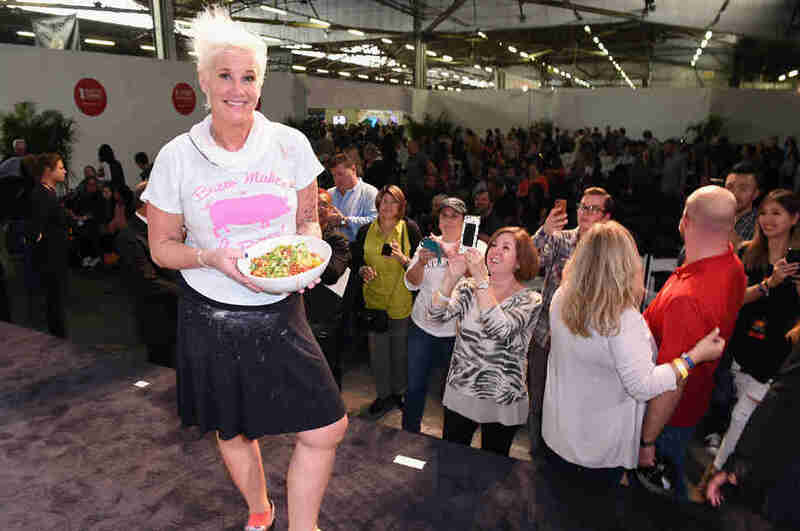 Take Anne Burrell -- she tries to get to her Carroll Gardens restaurant every day, but it’s not always possible if she’s shooting Worst Cooks in America, or traveling outside her native NYC. “I wanted to have my hands in food and feed people again,” she says -- but the reality of celebrity lifestyle makes even such a humble goal difficult to achieve. Sure, there are some excellent celebrity restaurants in Manhattan, like Geoffrey Zakarian’s The National and Bobby Flay’s Gato, but you won’t have the chance to snap a selfie with the famous faces, as they’ll almost certainly be elsewhere. “You think you’re paying to see a celebrity chef, and if she’s not there you’re missing half the experience,” Sietsema said. Make no mistake, you’re going for the food. And therein lies a fresh set of perils. 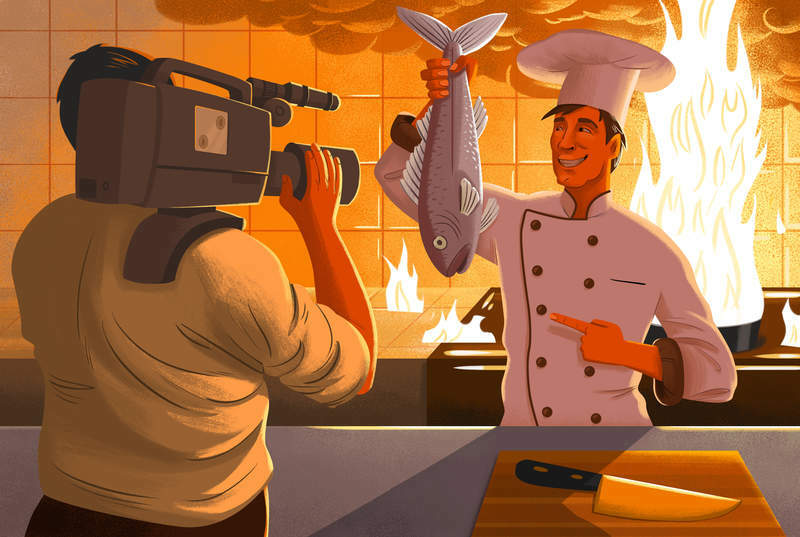 Though the days of attempting to jot down a recipe while watching a cooking show are long gone (thanks, the internet), viewers still are conditioned into thinking dishes A) are actually made on set as you’re watching, and B) taste anywhere near as good as they look. This launches expectations into a range that almost always will disappoint in one department or the other. Still, as long as there are celebrity chefs, they will try to leverage their notoriety into a New York restaurant. Perhaps the target audience is the tourist-heavy crowd that flocks to Times Square’s Olive Garden, TGI Fridays, or Red Lobster. For that mob, the likes of FatBird and Phil & Anne’s are an altogether different proposition: further out, unfamiliar, and more expensive. More likely, the aim is to attract diners with the promise of creative food made (or at least overseen) by a familiar, trustworthy TV personality, with a sure-fire conversation starter thrown in. On this count, Cora and Burrell succeed, and will no doubt secure a flow of eager, intrigued customers as a result. It’s incredibly hard to make it in New York’s restaurant scene -- about 80% of restaurants close within five years of opening -- so anyone confident they can beat the odds is usually either delusional or extremely wealthy (or both). Labor, food costs and rent make running a restaurant in New York City more expensive than anywhere else in the country, and it’s a fine line between success and failure. It’s not surprising, then, that most restaurants boasting a celebrity name -- especially in Manhattan -- are dang expensive. Even at Phil & Anne’s, which Burrell sees as “a neighborhood place,” a meal for two came to a hefty $110 (including $17 for a scant cauliflower steak, and without a big-ticket item like rib-eye or shellfish). In contrast, a low-key meal at my favorite neighborhood restaurant, helmed by Lady Gaga’s former personal chef Bo O’Connor, runs to about $80 -- and you get some of New York’s best fried chicken, enormous, lick-the-plate-clean salads, and cocktails crafted with locally distilled spirits. FatBird’s menu likewise doesn’t give you a break: $28 for chicken, kale slaw, and a biscuit, for instance, is steep even by Meatpacking District prices. “New York is such a global city. It’s one of the best cities in the world, so of course the stakes are higher,” Cora said. “New Yorkers and guests that frequent New York have very discerning palates and expect excellence in their dining experiences.” A love of challenges and propensity to set “the highest standards for myself” led Cora to opening FatBird, in the former space of The Diner on 14th Street, beloved for its all-day breakfast and cheap spiked lemonade. A sense of New York’s authentic character lacks in the olive-green pleather booths of Phil & Anne’s and the Chili’s-style cocktail menu at FatBird. It makes you wonder, what’s the point of opening in a city notorious for high rents, picky customers, and restaurant failures? But not even fame can protect these new ventures from the daunting physics of starting a restaurant in this city. For Cora, it’s about putting her stamp on the city. “My goal is to bring the best of my home state of Mississippi to the people who love New York like I do,” she tells me. “To bring all of my family recipes to the city that nurtured my career is a dream come true.” Despite some rocky reviews -- Sietsema’s among them -- Cora maintains that her restaurant is “doing great” and has a full house day and night. Phil & Anne’s Good Time Lounge opened Memorial Day weekend, the beginning of a notably slow period for restaurants. But Burrell said her Food Network background has helped her fill seats. To lure locals, Burrell said she tried to “read the neighborhood,” talking to the Clover Club’s Julie Reiner and asking neighbors for advice. She noted, though, that her restaurant is still evolving. The aim is to become “a neighborhood joint” where you can simply have, yes, a good time. Though a celebrity sighting might make or break an experience, Burrell still wants her guests to visit with the intention of getting a great meal. “I hope they come with the idea that the food is really good,” she said. “I like to think that my food is delicious.” Chefs have become fabulously famous in this town for accomplishing exactly that. Melissa is a writer based in New York who used to dream about being on Food Network and then opening a pasta-noodle concept in Manhattan. Ask her mom. And then follow her on Twitter and Instagram.